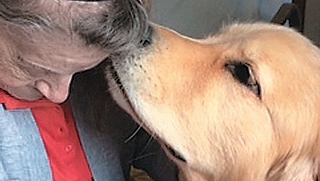 Volunteer leaves behind smiles, hope – and fur! On a sunny Wednesday morning, a group has gathered on the patio of the Siena/Francis House's men's shelter, surrounding a volunteer. She sits quietly, listening to guests, and at the end of the conversation, may shake hands. With four legs, weighing 50 pounds and covered in blonde fur, Piper is a 7-year-old yellow Labrador retriever who visits the Siena/Francis House weekly. With her facilitator (and owner), Leslie Sittlow, Piper greets guests with a happy dog smile. The Certificate of Pet Therapy will allow Haskell and his dog Addison to provide pet therapy at hospitals and nursing facilities throughout the region. DARTMOUTH, Mass. - Aug. 25, 2015 - PRLog -- Mark Haskell, President of Corporate Affairs and Government Relations for Stat-Southcoast EMS and its sister company Coastline Ambulance Services has obtained certification in Pet Therapy from the Community College of Rhode Island. As such, Haskell of Rehoboth, Massachusetts and his English Bulldog Addison will begin to provide the service in hospitals and nursing facilities throughout the region as part of the Stat-Southcoast EMS range of services. 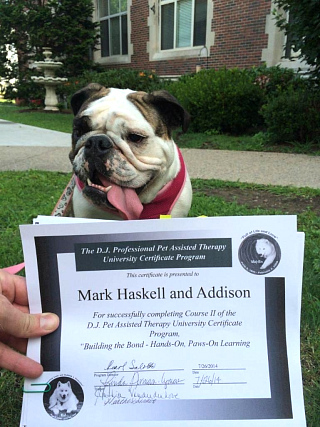 Haskell is also in the process of receiving his credential in Pet Therapy from the Windwalker Humane Coalition for Professional Pet Assisted Therapy in Rhode Island. 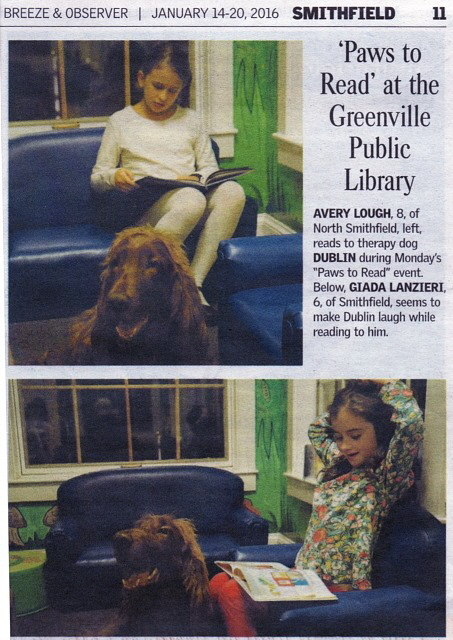 Animal-assisted therapy is a growing field that uses dogs or other animals to help people recover from or better cope with health problems, such as heart disease, cancer and mental health disorders. In addition, it provides comfort and enjoyment for hospital patients and nursing home residents. Haskell, a Roger Williams University graduate with a Bachelor's Degree in Business Administration, joined Stat Ambulance in 2010. Haskell has been an EMT since 1990 and also serves as Assistant Fire Chief on the Rehoboth, MA Fire Department. Carol Mansfield, owner/CEO of Stat-Southcoast EMS and Coastline Ambulance Services, said, "It gives us great pleasure to add Pet Therapy to our core of services and to announce Mark's certification in this important area of health care." 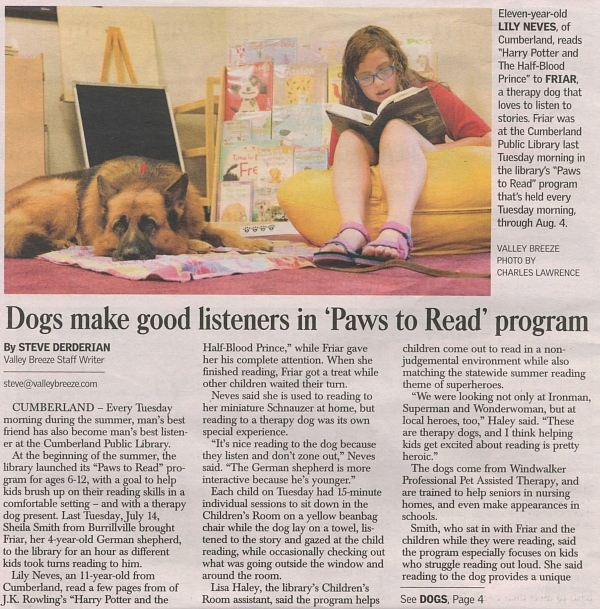 Windwalker therapy dog Banks at work. Southcoast Visiting Nurse Association's (VNA's) Hospice and Palliative Care program offers complementary care services designed to reduce stress for the patient and caregiver, provide pain relief and distraction, and create opportunities for joy and healing. Reiki—aids in stress and anxiety reduction, relaxation, and promotes increased vitality and general well-being. Massage—certified massage therapists provide comforting touch to relieve pain and promote relaxation. Music Therapy—whether performed by our volunteer Concordia Choir or played from a recording, it can address physical, emotional, cognitive and social needs. Pet-Assisted Therapy—pet companions bring love and affection that can help individuals relax, and enhance and touch lives by bringing comfort, companionship and relief. For more details on the program and its services, visit Southcoast VNA or call 508-973-3200. All of Southcoast VNA's volunteer complementary care services are made possible thanks to your continued contributions and the countless hours of services by our volunteers. FedEx Express Courier Delivers for RISPCA "Hearts & Paws"
Meet Renée' DeMello, a FedEx Express courier from Rhode Island. Like most of us, Renée has a special place in her heart for animals, specifically those who have been mistreated or who don't have a home. When they say one person can make a difference in the life of an abused or homeless animal, Renée is that person. 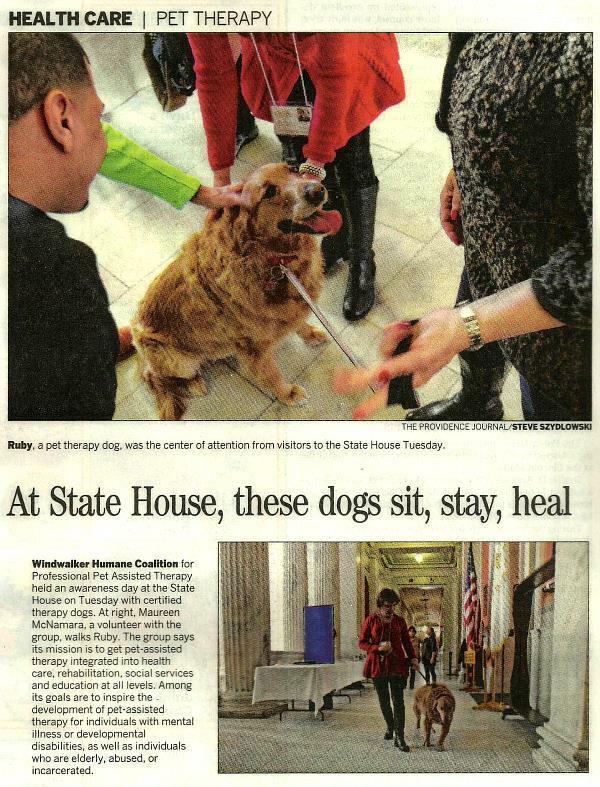 She is an active supporter of Rhode Island Society for the Prevention of Cruelty to Animals (RISPCA). RISPCA was the first humane organization in Rhode Island and at 140 years old, they are the third oldest humane organization in the United States. Renée heard that the RISPCA needed help with transporting donated items to their Hearts and Paws fundraising dinner on March 14, 2014. "I deliver important shipments every day, so why not make a special delivery to help the animals in my community?" she said. FedEx has a long history of helping animals in need. Renée asked her manager if she could volunteer and use her FedEx Express delivery vehicle to transport donated items for the event. Teddy (an 8-year-old Pomeranian mix, available for adoption at rispca.com) and Jim McGee, RISPCA Director of Development, helped load the donated items into the FedEx Express vehicle. "I'm glad we were able to use my delivery vehicle. We needed a large van to transport all the donated items and it still took us two trips," said Renée. In addition to providing transportation for the event, FedEx donated a Denny Hamlin autographed #11 NASCAR for the RISPCA auction. Renée said, "Denny, you made Jack, a six-year-old boy, very happy. He was the highest bidder on your autographed #11 NASCAR. Jack stood by the car and nobody had the heart to outbid him!" The community showed its support and over 300 people attended the "Hearts & Paws" event. RISPCA cares for more than 1500 animals per year. The $20,000 raised will help provide care for homeless animals in the community who are in desperate need of veterinary care, food and adoption. "I would like to thank FedEx Express for letting me volunteer for this event and be a voice for those who cannot speak for themselves," said Renée." © Copyright 2015-2019 Windwalker Humane Coalition. All rights reserved.